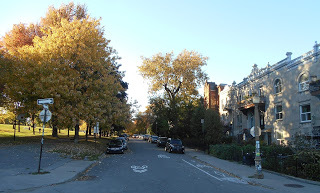 Welcome to the nineteenth installment of the Haunted Montreal Blog! Released on the 13th of every month, the November 2016 edition focuses on research we are carrying out into a ghostly soldier who is known to roam L’Esplanade Street in the Plateau borough. With the Hallowe’en Season officially over, Haunted Montreal is moving into its winter mode and is not offering any more public tours until May, 2017. Stay tuned for some of the ideas we are planning for the winter months! Jeanne Mance Park is one of the best places in Montreal for ghost sightings. Occasionally, residents even set up lawn chairs in the evening on the south-eastern slope of the park on L’Esplande Street, waiting for the apparition to arrive. There have been many reports, some of them recent, about a mysterious ghostly soldier who has been seen limping in the area. Witnesses have reported seeing him walking with a cane up a long set of wooden stairs, and entering to one of the old homes at the dimly-lit southern end of l’Esplanade Street. 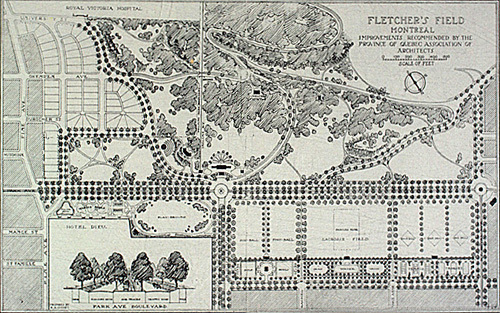 Jeanne Mance Park was once called Fletcher’s Field. The history of this park began at the end of the 19th century with the planning of Mount Royal Park. The city’s acquisition of land for Mount Royal Park included the summit of the mountain to Esplanade Avenue, between Pine Avenue to the south and Mount Royal Avenue to the north. Fletcher’s Field was originally designed for military parading, however, it had many other uses. 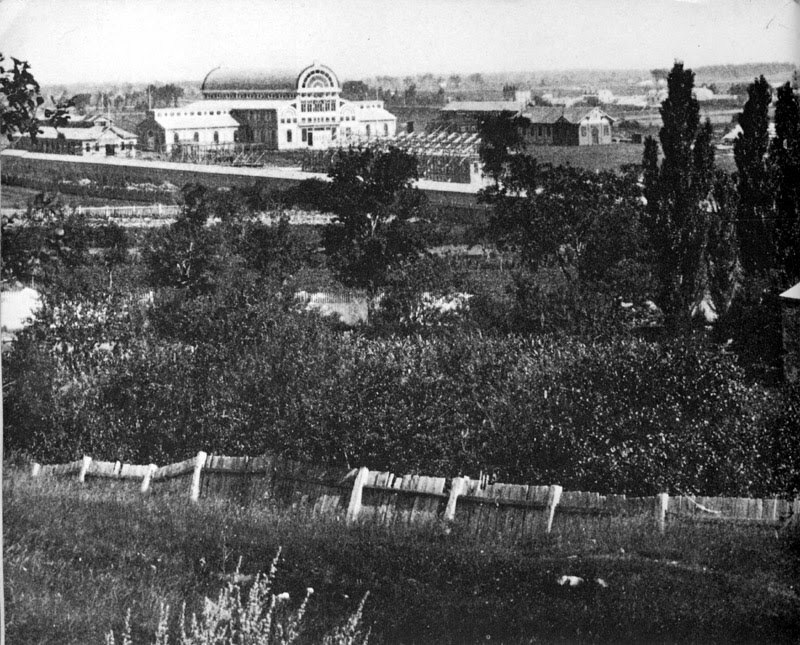 In 1878, Montreal’s Crystal Palace, a gigantic piece of architecture that appeared to be made entirely of glass, was relocated to Fletcher’s Field from the downtown area. Crystal Palace had originally stood at the corner of Ste. Catherine and University Streets. It was inspired by a much vaster building of the same name that was erected in London, England for the Universal Exhibition of 1851. It had the same barrel-vaulted shape and iron-girder framework, but Montreal’s version was a mere tenth the size London’s at just 56 meters long, plus it had brick and not glass walls due to the Canadian winter. When Crystal Palace originally opened in Montreal, it exhibited products such as textiles, furniture, machinery, food, and Canadian art. 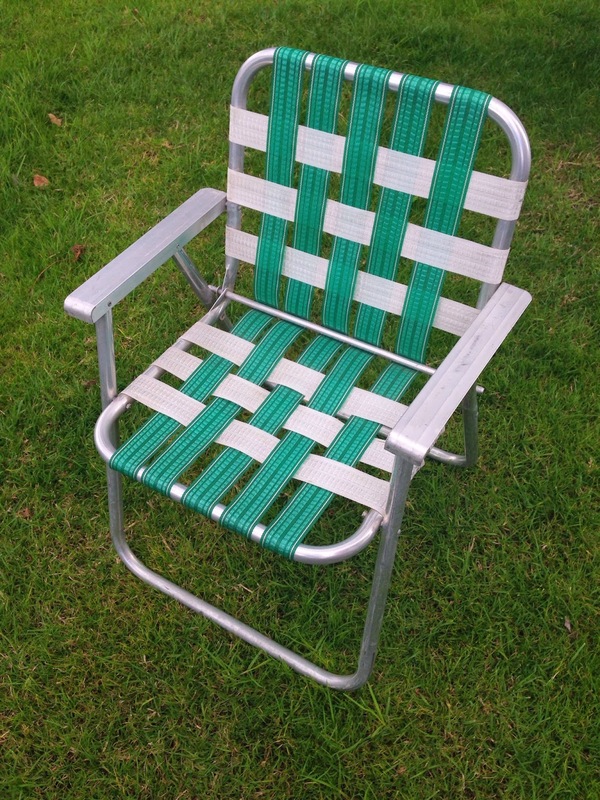 It was moved due to issues with land ownership. McGill University owned the land beneath and when the board and the university couldn’t agree in 1877 on a price for this property, the Quebec government stepped in and purchased it on behalf of the board for $80,000. Crystal Palace was dismantled and re-erected on the newly established fairground on Fletcher’s Field. Its new purpose was to form an Exhibition Grounds, this time near Mount Royal Avenue. 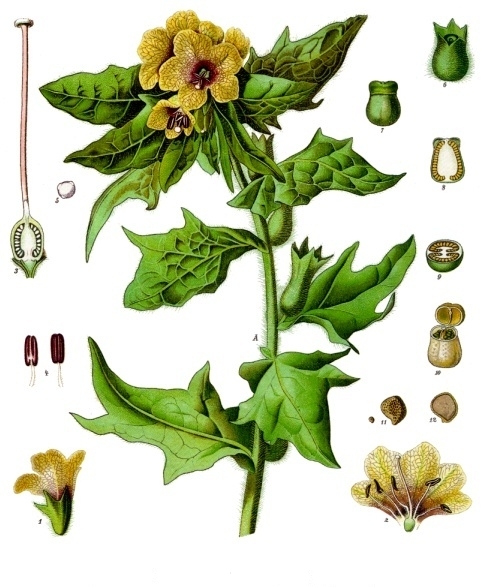 Fletcher’s Field was also a notable source of Henbane, according to the Pharmaceutical Society of Great Britain. The psychoactive and somewhat poisonous plant, also known as Hyoscyamus niger, produces hallucinations and feelings of flight when ingested, no doubt providing some residents with endless opportunities to indulge in the substance. 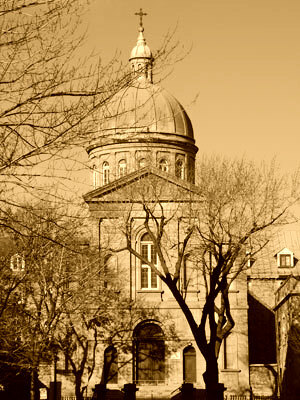 To the south of the field is Montreal’s oldest hospital: Hôtel-Dieu de Montréal. It was originally founded in what is now Old Montreal, by Jeanne Mance, on October 8, 1645. 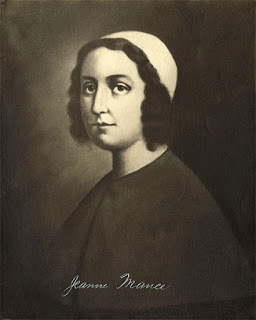 Jeanne Mance was the first nurse in New France, arriving in 1642 with colonists to establish the religious settlement of Ville-Marie. Sponsored by the “Notre Dame Society for the Conversion of the Savage Peoples”, Jeanne Mance built the hospital to treat injured colonists, soldiers and converted native inhabitants during the wars with the local Mohawk First Nation, on whose territory the colony was built. Over the years, the Hôtel-Dieu hospital suffered three fires, but it continued to grow with the city’s increasing population. In 1861, the hospital moved to its present site near Mount Royal. Not only was the old location near the river getting too dense and overcrowded, but the fresh mountain air was also seen as being important for healing. When the living nuns and patients move to new hospital on the mountain they also took all of the remains of the deceased nuns, who were transferred to the chapel of the new Hôtel-Dieu. 178 nuns had died over the span of two centuries, however only 23 coffins were needed to carry all the dusty bones to the new location. They are still there. In 1910, at the time of the Congrès eucharistique de Montréal (Montreal Eucharistic Congress), devout Catholics demanded that the park pay homage to Jeanne Mance as the founder of the first Hôtel-Dieu de Montréal by renaming the greenspace temporarily. 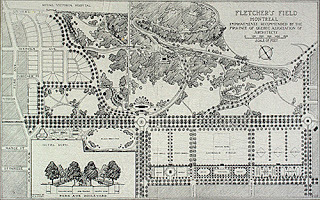 The new name for Fletcher’s Field proved so popular that the City of Montreal made the name change officially permanent in 1990. There are many theories about who the ghostly soldier might be. While some online rumours suggest the military apparition is of French stock, others believe he is British. One feasible theory takes us back to 1885, when Montreal was in the midst of a smallpox epidemic. 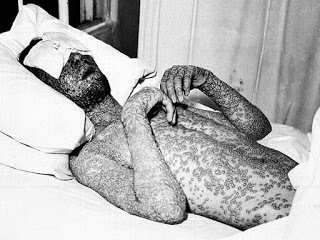 During the era, smallpox was seen as the worst possible disease. Not only was it extremely infectious, but it could disfigure and even destroy people within a week or two. Infection was caused by breathing contaminated air or touching something that had been in contact with the variola virus. Following a 12 day incubation period, tiny red pustules would appear on the victim, and eventually spread all over the body. These would soon burst and begin oozing pus and ravaging the body. In about a third of cases, the disease killed its victim with days. In cases of survival, the victim was often left disabled and permanently disfigured, with deep pock marks replacing the old pustules once they had healed. In 1885, Montreal’s smallpox epidemic was so bad that they had to re-open the smallpox hospital at the Hôtel-Dieu de Montréal to isolate patients to try to stop the spread of the disease. The smallpox hospital had been built during another epidemic in 1872 and was shuttered several years later, in 1875. By 1885, it was seen as run down and many citizens did not want to send their sick relatives there. Officials began concocting a new plan to deal with the crisis. When the number of patients rose dramatically, the buildings in the Exhibition Grounds to the north of Fletcher’s Field were commandeered. In hopes of assuaging the fear of the citizens, authorities converted one of the provincial exhibition buildings into a clean and spacious temporary smallpox hospital. 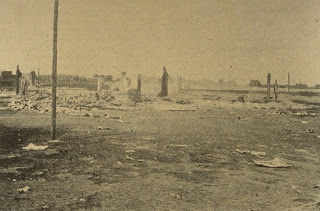 However, local residents were terrified of this disease and those who lived near the Exhibition Grounds protested vigorously with a large scale riot. The army was called in to quash the unrest and keep order. They were instructed to guard the new temporary hospital buildings. This was an assignment many soldier feared due to the high risk of contracting smallpox. 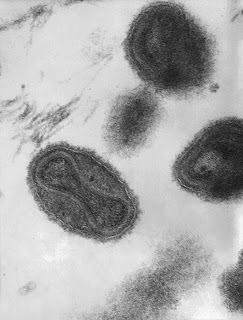 In 1885, thousands of people died of smallpox in Montreal before the winter finally snuffed out the virus. It was to be the last time the disease ravaged the city, but not before taking a terrible toll. Overall, 9,600 people contracted smallpox in the administrative territory of Montreal, and 3,234 of them perished. Out of a population of about 167,000 citizens, approximately 2% of Montrealers were killed by the horrifying disease. Following the epidemic, it wasn’t long before the smallpox hospital in the Exhibition Grounds was closed. Just over a decade later, in July of 1896, the Exhibition buildings that sheltered the temporary smallpox hospital were destroyed by a fiery inferno that had accidentally been started when tramps squatting on the property emptied a tobacco pipe that was still smoldering, sparking the blaze. 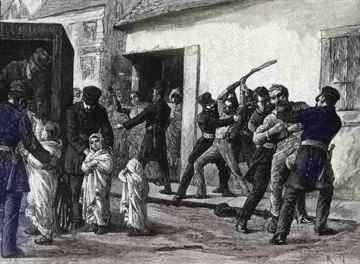 While there is little evidence today of this tragic episode in Montreal’s history, perhaps the mysterious ghost of the limping soldier is the best reminder of our smallpox history. Because of the highly contagious nature of smallpox, many of the soldiers guarding the Exhibition Grounds contracted the disease themselves. As such, there is speculation that the ghostly soldier who haunts L’Esplanade Street could very well be one of the old hospital guards who was debilitated by smallpox in 1885 while on duty. Why he is seen going up a flight of long wooden stairs is anyone’s guess. With the Hallowe’en Season now over, Haunted Montreal is moving into winter mode, meaning there will be no more public tours until May, 2017. Private tours are still available for groups of 10 or more people, subject to the availability of our actors and weather conditions. We are going to try and develop some activities for the winter, such as haunted pub crawls and ghost investigations in haunted buildings. If you have any suggestions for haunted activities during the winter months, please contact info@hauntedmontreal.com. We also plan to improve and upgrade our website and blog to make them more manageable and user-friendly. A big thank you to all of our clients who attended a Haunted Montreal ghost walk during the 2016 season! If you enjoyed the experience, we encourage you to write a review on our Tripadvisor page, something that helps Haunted Montreal to market its tours. 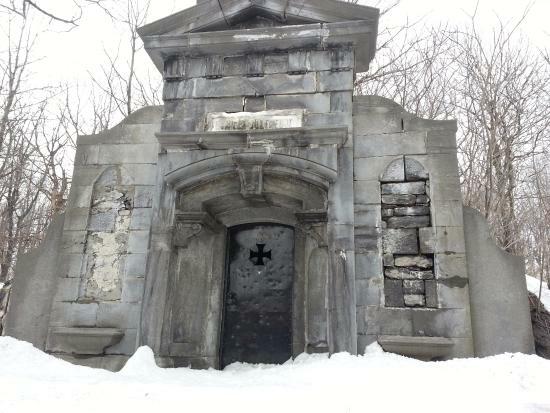 Located high up on the slopes of Mount Royal, the Protestant Mount Royal Cemetery is rumoured to be one of the most haunted places in Montreal and is often described as a City of the Dead overlooking a City of the Living. Haunted Montreal recently received an anonymous letter from a person who had a terrifying experience in the graveyard. The letter-writer claims that a spirit followed him or her home. After going to sleep, the author was woken up by a ghostly male figure who was quietly uttering his or her name. Drenched in sweat from fear, the letter-writer found the strength to turn on the light, only to realize there was nobody present. 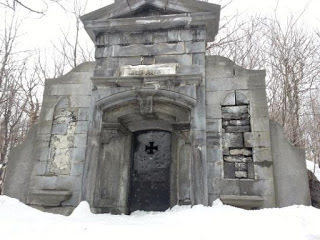 In telling Haunted Montreal the story, the author joins a long list of others who have experienced ghostly and paranormal activity in the Protestant Mount Royal Cemetery. Donovan King is a historian, teacher and professional actor. As the founder of Haunted Montreal, he combines his skills to create the best possible Montreal ghost stories, in both writing and theatrical performance. King holds a DEC (Professional Theatre Acting, John Abbot College), BFA (Drama-in-Education, Concordia), B.Ed (History and English Teaching, McGill) and MFA (Theatre Studies, University of Calgary). I have seen some people spending a night at Mont-Royal cemetery last summer. Ghost hunters or just students, no idea. But they obviously were ready to spend their night there. If you are not on our mailing list, please sign up here to receive the blog every month on the 13th!